THE CONVERTORUM: We can make him stronger, faster... Eviler. We can make him stronger, faster... Eviler. 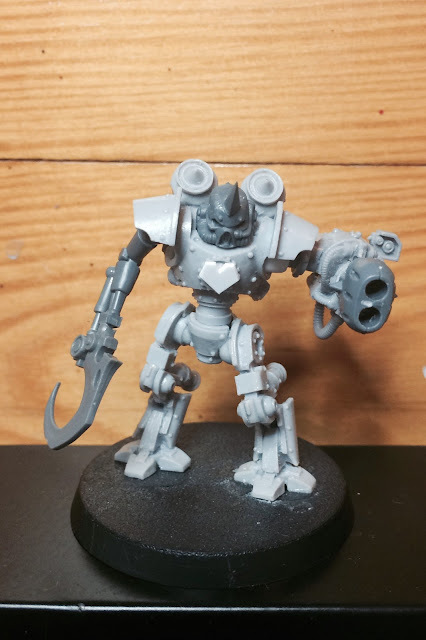 Some bionic heavy reinforcements for the Mhorrigotii minions. Not finished by a longshot, there's chains, nails and tattered cloth to add, but it's a start. Love your eclectic builds Jeff! He's deceptively big ain't he? Glad you like 'em sir! Um. How do you mean "deceptively"? The body's based on a thallax so he's about termie size. Ah I see. Yeah - that head is enormous. I´m actually going to change it - probably go with a scion head covered in ragged cloth.